As you may be aware, we have set ourselves the challenge of raising £10,000 for charity this year. Our chosen cause is Combat Stress, who provide mental health care for British Armed Forces veterans. So that we can raise this massive sum, we’re organising a range of events this year. Lots of us giants are taking part and as the dates start to loom, the training is getting underway. Our plucky paddlers, Luke, Anthony, Lee, Mersudin and Tom, are learning how to kayak with the instructors at the Seapoint Canoe and Kayak Centre. This means lots of falling into cold water in the canal but they’ve got to learn the ropes before tackling the 150 mile route around Kent in the summer. Seapoint is one of our supplier sponsors, providing training and certification. Sea Kayaking UK are providing us with five Explorer sea kayaks to use during the event, and we’ve been given a Mahee sit-on kayak from Fat Yak, which we’re going to use for training purposes. Coming up in May is the London 2 Brighton 100k. Mersudin and Tom (gluttons for punishment!) will be joined by Sean to attempt to run as much of the route as possible. Luckily, there is plenty of support along the way with the organisers providing food, sports physiotherapy and much-needed hydration. The guys are getting their training underway and working on their stamina in particular. In July, ten of us are doing the Yorkshire Three Peaks. We’ve managed to secure discounts from retailers, including Mountain Warehouse and Cotswold Outdoors, to help us purchase equipment such as first aid kits, maps, and waterproof gear. There are some training walks in the pipeline, as this is the only event some of us are taking part in. We have to practise walking for many hours on end; the challenge is to complete the 23.5 mile route in 12 hours. We have held, and are planning more, events that don’t involve getting wet or hot and sweaty. Our Valentine’s Day cake sale raised £50, and a LAN gaming night in the office raised £25. As you can see, we have got a way to go! You can sponsor us by visiting our Just Giving page, or if you want to be one of our corporate sponsors, get more information on our Giant Challenge page. 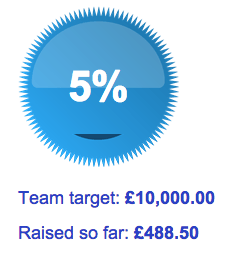 A big thank you to all who have sponsored us so far. Your generosity will go a long way to help British veterans in need. This video was featured on BBC Sport Relief and tells the story of one veteran’s battle with PTSD and how Combat Stress has helped him and his family.